Some 50 miles west of Socorro, beyond Magdalena and on the Plains of San Agustin, US-60 passes through the Very Large Array (VLA). A radio astronomy observatory located at an elevation of 6,970 ft. It has 27 antennae with each 82 ft diameter dish positioned on three arms of a Y shaped rail track; each arm being 13 miles long. Used to investigate many astronomical objects, like galaxies, quasars, pulsars, supernova remnants, gamma ray bursts, radio-emitting stars, the sun and planets, astrophysical masers, black holes, and the Milky Way. On the first Saturday of each month there is a guided tour of the facilities. Of course, my trip past was not then. But, I stopped to take photos and later read up on the VLA. 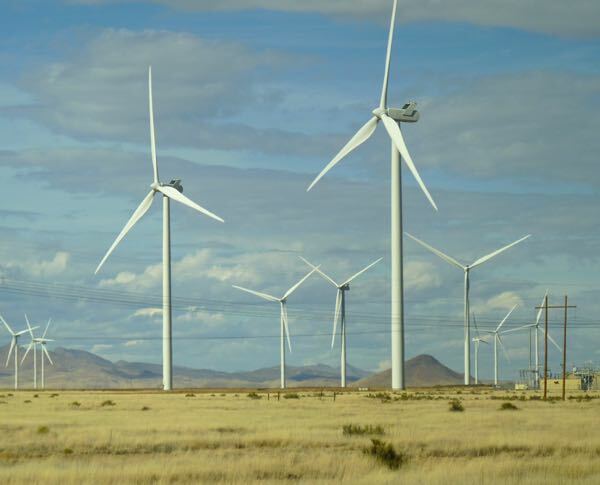 Further south, along NM-26 east of Deming, can be found the Macho Springs Wind Farm. 28 modern windmills spread out on 2,000 acres of ranch land. The 120 meter tall towers, with 100 meter diameter blades produce 50 megawatts of electricity which sells for half the price of coal powered plants. 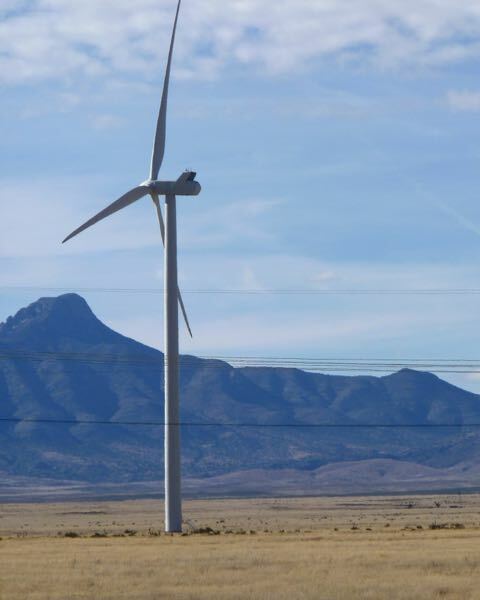 Wind generated power potentially could provide for all of New Mexico’s needs. Nearby the wind farm is the Macho Springs Solar Farm that also produces 50 megawatts of electricity. I couldn’t find it though. Interestingly, it appears most of the power is being sold to Tucson and El Paso. So much for helping New Mexico’s energy needs (highest bidder you know). FR-549 heads south from Hwy 60, east of the VLA, and has LOTS of great free boondocking areas along it. 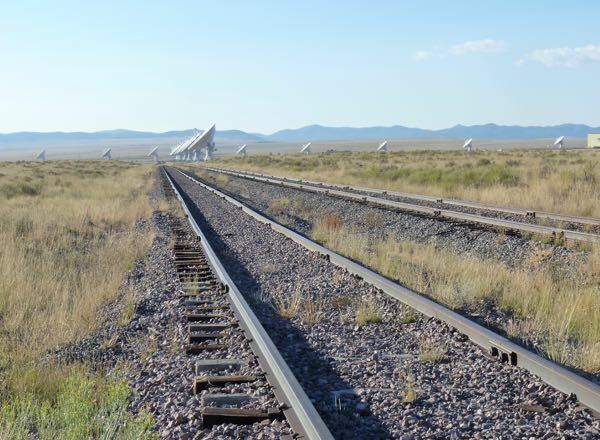 It even crosses one of the VLA rail tracks. Thanks for that tip Barney. Next time I’m in the area I’ll check it out. It was early in the morning, and I had just left a free overnight camp in Pie Town. So, I wasn’t looking then. How ironic that New Mexico sells the energy to Tucson AZ and El Paso TX. I wonder if the citizens of New Mexico get a break on their energy bills since the power companies are bringing in the money from those other states. Good question Gypsy. These “farms” are privately owned companies, so I doubt the state is much involved, other than regulation. I enjoy your new website and look forward to your new posts. I’ve kept the link to your former site because it has great reference material. Thanks for sharing with us! Thanks for following the journey Gumo. Glad you enjoy the new look. FYI all of the info from the old blog has been moved to this new one. Eventually, the old blog will go away. Have you seen many antelope? I ask because years ago when I passed the array, antelope seemed to be everywhere and I had never seen them before. 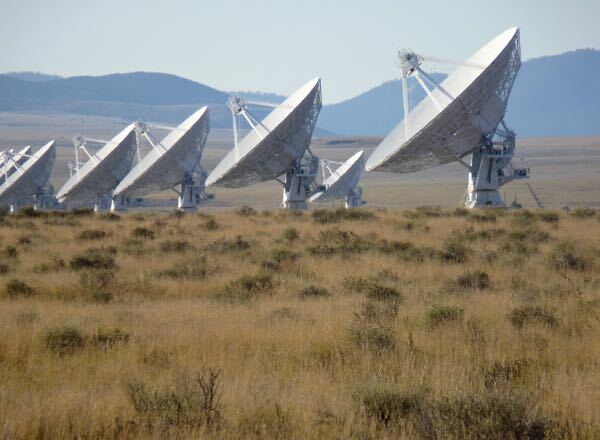 I didn’t see any antelope by the VLA. But, I have seen plenty during my travels. My post about Flaming Gorge has pix.